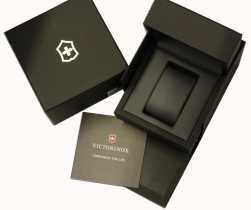 Authorised retailer for Victorinox Swiss Army Watches. Free delivery, 30 day free returns and five-star rated service. Buy now with up to 12 months 0% finance. Victorinox Swiss Army are most well known for producing the Swiss Army Knife, they are the only suppliers of the Swiss Army Knife in the world. They also produce a wide range of watches which have been widely praised for their quality. Victorinox watches come in a wide number of collections and range from luxury dress watches to the immensely durable I.N.O.X range. Victorinox were founded in 1884 when Karl Elsener I opened a knife cutler's workshop in Ibach, Switzerland and began supplying soldiers knives to the Swiss Army in 1891. The Swiss Army Knife was patented in 1897. The name of the company is made up of Karl Elsener I's mothers name, Victoria and the international term for stainless steel, Inox. Victorinox entered the watch industry in 1989 with a North American partner building on the strong brand with quality timepieces. Victorinox are still owned and operated by the Elsener family with Carl Elsener IV currently at the helm. The Victorinox Swiss Army I.N.O.X collection is the range for anyone with an adventurous lifestyle. I.N.O.X watches can handle big drops, high altitudes and extreme heat or cold. Victorinox Swiss Army watches are always stylish and this range is no different, sporting a beautiful classic style. No matter where you are going to be using the watch - in the office or on a mountain - you can wear this watch with confidence. The Victorinox Swiss Army Chrono Classic is a collection of beautifully designed watches with exceptional build quality and technical brilliance. The chronograph was originally accurate to 1/10 th of a second but has been updated to be accurate to 1/100th of a second. If you are looking for an impeccably designed watch with an amazing build and incredible technology then this range is perfect for you!